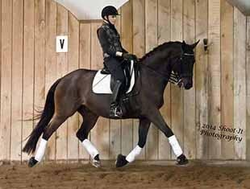 Debbie Hill and Katie Stoy Dressage offers a beautiful black 6yo mare for sale, Hohenstein x Furst Heinrich, in professional training with Debbie Hill since 3.5. 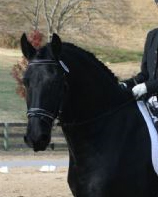 Winner of US Dressage Finals at training level and 7th place at Four Year Old Young Horse Championships. Sensitive but sensible. Appropriate for AA and professional. Third level. 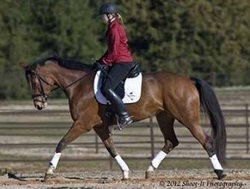 16.3hh, Located in Loxahatchee, FL thru the end of March. 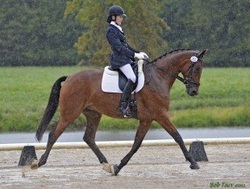 Roslyn is an athletic young prospect with FEI potential. She is a very elegant modern type with lots of chrome! She will definitely turn heads in the show ring. She has 3 very correct and expressive gaits. She is also very confident and mature for her age. She is amateur friendly, but has enough scope and talent for a professional. Roslyn would be a great candidate for the FEI Young Horse Program. Roslyn is also impeccably bred. By Rotspon (Rubinstein) out of a Weltmeyer line mare; she is bred for both power and rideability. She would produce lovely foals! No soundness or health issues. She travels well even by herself. She is currently in full professional training. 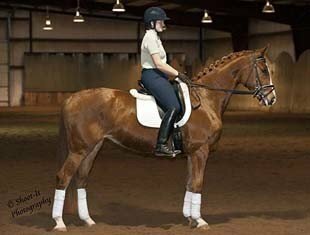 Here is your chance to learn all of the Grand Prix movements on a schoolmaster at a very reasonable price! Izod is a sweet, kind and willing horse. He is safe, and would be suitable for a Junior, Young Rider or adult amateur. Izod has three correct gaits. He is confirmed at all the Grand Prix movements. 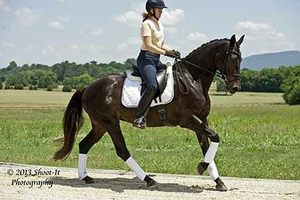 He is very easy for pirouettes, and can do one tempi's all day long! He is the happiest working at home. It is difficult for him to string all of the Grand Prix movements together into a test in the show ring. However, he would be a slam dunk for your Silver medal and small tour. He's the same horse to ride everyday. There is never any need to lunge him, and he's fine to hop on and ride on a cold day after several days off. He loves to trail ride. He has no vices or soundness issues. He has a current set of x-rays that are very good. What Izod doesn't have in exuberance he makes up for in kindness and rideability. He has been owned by the same adult amateur rider since was an unstarted youngster. He has been in a professional training barn for many years. 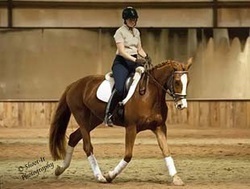 He is offered for sale so his current owner can focus on developing her next young horse. We feel Izod has a great deal to teach his next partner. There is video of Izod with a professional, as well as an entire lesson with a 13yo second level rider who has never ridden him before. She had NEVER ridden any horse above second level before this ride. Watch her working piaffe and passage! This will let you see how kind and willing a teacher he is. 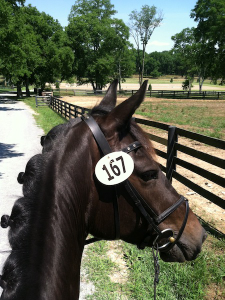 On her second ride on Izod, she was able to do all the tempi changes, INCLUDING ONE TEMPIS! Super Opportunity to purchase a very well trained, correct 4 year old with a wide open future. This filly is going to be a star! She has a charismatic personality and the good looks to get you noticed in the ring. 3 beautiful and correct gaits that are well balanced and smooth to ride will get you the scores to win! Mia was bred and raised to be a show horse and that is how she has lived her young life. She is well traveled and will come out of the trailer and go straight to the schooling ring, ready and willing to do her job. Branded AWS and registered with the Friesian Sporthorse Association, lifetime registered with USEF and USDF. She is solid training level showing and already has a baby shoulder in and leg yields. Very quiet in the mouth and steady into the contact, all you need to do is get on and go!! Currently in full training with Katie Stoy/Debbie Hill in Huntsville AL. Fancy is a lovely young prospect that is extremely Amateur friendly. She is sweet and very calm. She has three balanced gaits and should move right up the levels. She has no soundness or health issues. She is easy to handle for vet and farrier, travels fine, and settles into new situations quickly. She is very well bred on top and bottom. She would have lovely foals if new owner decides to breed her. She is by the Elite stallion Fabuleux by Fabriano. Her dam is SPS Mon Amour by Matcho. Her temperament is very impressive. Snapee is currently showing Second level and schooling all of the Third level movements. She is entered in her first show at Third level at the end of March. She has three super gaits. She scores an 8 for her gaits on the majority of her tests. She almost always scores 8's on all her walk work. She has been extensively shown Training thru Second level with many scores in the upper 60's and lower 70's. She is straight forward and would be suitable for a Junior or Amateur, but fancy enough for a professional to bring along. Snapee is healthy and sound with no vices. She has never been sick, injured, or had any soundness issues. She clips, hauls, and settles in quickly in new environments. She is the same horse at shows as she is at home. She loves trail rides or hacking out in the fields. She has even been ridden on the beach in the surf. Price has been reduced for a quick sale!! He is a gentleman and would be suitable for an Adult Amateur, Junior rider or a professional looking to earn their gold medal. He is very close to being a Grand Prix horse. Sol has no soundness or health issues. He trailers well and is the same horse away from home as he is at the farm. He loves going out on hacks in the field and on the hills. He can be ridden in snaffle or double bridle & is easy to sit. Rider in video and pictures is 5'10" tall. He is a smaller horse but has the presence to carry a taller rider. Owner is a petite amateur who he is happy to work for as well. 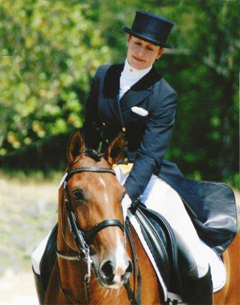 Wilda May is a 2003 Main Studbook Hanoverian. She is a proven embryo transfer recipient mare of one foal and an excellent mother. Her sire is Wildcard and she is out of MSB Almost Heaven by Armin. The owner is the breeder. Wilda May has recently been put back under saddle after having a foal. She is amateur friendly and has 3 big smooth gaits. She is being started over fences and has a natural flying change. 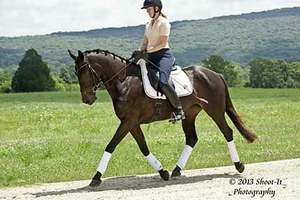 Wilda May is well suited for dressage, eventing, and hunter/jumpers and she is good on trail rides. Ruffino is a doll to train and have in the barn. He has a super attitude and really enjoys his work. He has never been injured, sick or had any soundness issues. He is the same horse at shows as at the farm. He also enjoys hacks out in the field and trail rides. Ruffino has a very successful show record. I welcome you to check out his entire show record on centerlinescores.com. His USDF #1083038. His mean score at Training and First levels in 2010 (his first show season) 73.4% and 70.8% respectively. He was ranked 11th in the nation; USDF HOY rankings at Training level. His mean score at Second level in 2011 was 69.5% ranking him 16th in the nation; USDF HOY rankings. He was Champion American Hanoverian Society 2nd level 2011. He also competed in the USDF/Markel Young Horse program in 2011 as a 6-year-old. He qualified for the National championships with a 7.91 average in the qualifying classes. He has a confirmed change and is ready to go out Third level. Currently schooling 4th/Prix St Georges. He is a kind and athletic horse with tons of potential. He has been with one professional rider for his entire dressage career. He goes nicely in the snaffle or double bridle. Gilad Van Rosita "Laddie" is a beautiful Friesian Gelding ridden by Katie Stoy. He is quiet and well mannered. 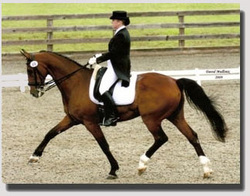 Laddie scored in the 70's at his first recognized dressage show at training level! He received 8's on his gaits. He's currently schooling first level. He has tremendous presence and eye catching gaits. His canter is very expressive. Laddie is a dream to have in the barn. Tons of personality and easy to handle. He has no health or soundness issues. He's very quiet- definitely amateur or junior friendly. He travels well and is well behaved on or off the farm. Match Point "Dexter" is a very willing and sweet coming four year old gelding. He's been in full time professional training for the past three months. He's extremely willing, and a fast learner. He has three lovely gaits and tons of potential. Dexter is quiet enough for an Amateur but nice enough for a professional to bring along. His canter is extremely well balanced and uphill. He can canter all day long! He has tons of personality and is a pleasure to have in the barn. He has no vices, soundness or health issues. Kaspar is a wonderful schoolmaster who has been shown successfully through Intermedaire-I. Showing is definitely his forte! He has gotten four riders their Silver medals in the past 3 years. 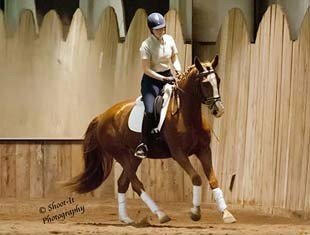 He helped his current rider get her Silver medal in their first two shows together and was alternate for the Region III YR team in 2009. 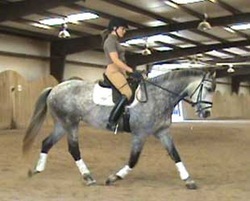 He has excellent lateral work, pirouettes, and tempi changes down to the 2's. 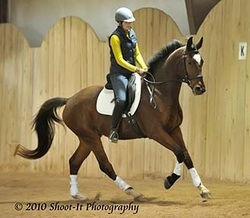 He enjoys showing off in the ring and would be perfect for a Junior or Young Rider wanting a capable mount for NAYRC. Kaspar is a gentleman and has impeccable ground manners. He travels well, has no vices, and really enjoys hacking out! He loves having his own "person" to give him attention. Kaspar vetted wonderfully in Sept. 2008. He is very sound and an easy keeper! Priced reasonably to sell because his owner is starting nursing school in January. Kaspar is a must see for any serious competitor. Gabriella is a beautiful dapple grey mare who is very amateur friendly. Currently in professional training schooling all the the Third Level movements. 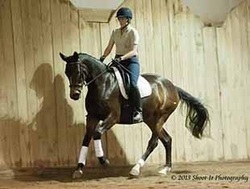 She has a beautiful canter with naturally clean changes. She has not been doing changes long, but they are coming along easily for her. All the lateral work is very simple for her. Her half passes are push button. She is light in the bridle and ridden daily in the snaffle. She is compact and has very comfortable gaits which would be easy for an amateur to learn their seat on. She is a brave and confident horse with tons of personality. She is fine to ride in the ring, out on trails and away from the farm. She has no soundness or health issues. She is fine turned out alone or with other horses. She is ready for you to earn your Bronze Medal on!